Re-Visioning Terrorism: A Humanistic Perspective is an interdisciplinary collection of essays that aims to offer a plurality of visions on terrorism, expanding its meaning across time and space and raising new questions that explore its multifaceted occurrences. 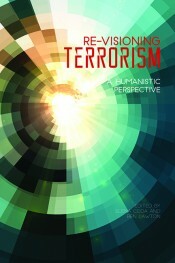 The different ideological, philosophical, and cultural perspectives emerging from the essays and the variety of humanistic disciplines involved intend to provide a complex and even contradictory picture that emphasizes the fact that there cannot be a univocal conception and response to terrorism, in either the practical or the intellectual domain. The editors borrow the concept of rack focus response from cinema to create an innovative and flexible interpretative approach to terrorism. Rack focus refers to the change of focus of a lens so that one image can come into focus while another moves out of focus. Though the focal distance changes, the reality has not changed. Both items and events coexist, but given the nature of optics we can only see clearly one or the other. This occurs not just with lenses, but also with human perceptions, be they emotional or intellectual. The rack focus response requires that we try to shift focus from the depth of field that is absolutely clear and familiar to the “other” that is unclear and unfamiliar. This exercise will lead us to reflect on terroristic events in a more nuanced, nondogmatic, and flexible manner. The essays featured in this volume range from philosophical interpretations of terrorism, to historical analysis of terror through the ages, to cinematic, artistic, and narrative representations of terroristic events that are not limited to 9/11. Elena Coda, associate professor of Italian at Purdue University, teaches Italian and comparative literature. She focuses on the intersection of cultural, ethnic, and national identities in pre-WWI Trieste when it was part of the Austro-Hungarian Empire. The author of Scipio Slataper (Palumbo, 2007), a key irredentist figure at the eve of the Great War, and of many articles on Triestine literature, focusing on writers such as Italo Svevo, Scipio Slataper, and Umberto Saba, she coedited the bilingual anthology The Promised Land: Italian Poetry After 1975 (Sun and Moon Press, 1997) and the collection of essays Balleriniana (Montanari, 2010). Ben Lawton, associate professor of Italian and film/video studies at Purdue University, teaches and writes about cultural construction in cinema. Translator of Pier Paolo Pasolini’s Heretical Empiricism (Indiana University Press, 1988; New Academia Publishing, 2005), Lawton has edited over fifteen volumes on film studies, cultural studies, and Romance languages and literatures.